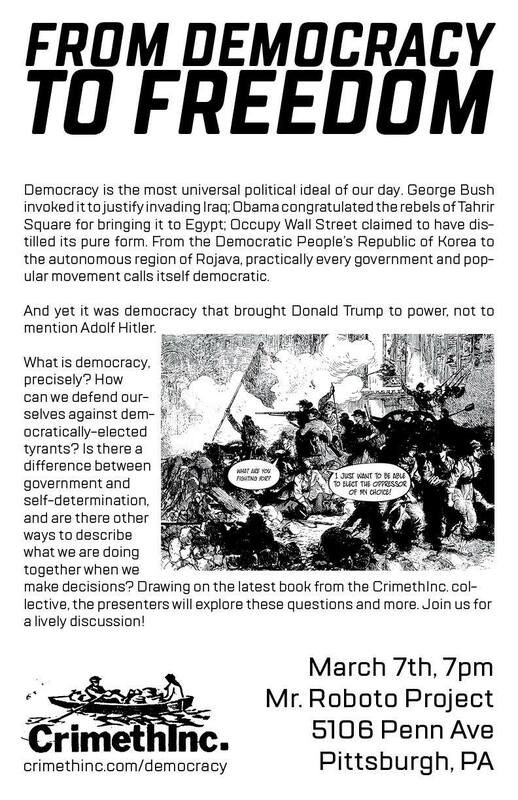 From Democracy to Freedom — CrimethInc Book Talk at The Mr. Roboto Project – S.C.A.M. To celebrate the release of their new book, From Democracy to Freedom, folks from the CrimethInc. ex-workers collective are on tour. Come out to see them talk when they visit the Steel City. 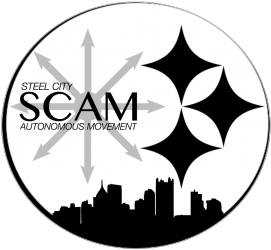 The talk will take place at 7pm The Mr. Roboto Project, Wednesday March 7th, and is co-hosted by The Big Idea Bookstore collective and the Steel City Autonomous Movement. Democracy is the most universal political ideal of our day. George Bush invoked it to justify invading Iraq; Obama congratulated the rebels of Tahrir Square for bringing it to Egypt; Occupy Wall Street claimed to have distilled its pure form. From the Democratic People’s Republic of Korea to the autonomous region of Rojava, practically every government and popular movement calls itself democratic. And yet it was democracy that brought Donald Trump to power, not to mention Adolf Hitler. How can we defend ourselves against democratically-elected tyrants? What is the difference between government and self-determination? Drawing on the latest book from the CrimethInc. collective, the presenters will explore these questions and more. Join us for a lively discussion!